These new custom manufactured, highly corrosion-resistant conductors with high current carrying capacity can withstand harsh environments and extreme thermal cycling. Anomet TiCu Clad Electrodes are ideally suited for chemical processing, electroplating, metal finishing, and metal recovery applications. 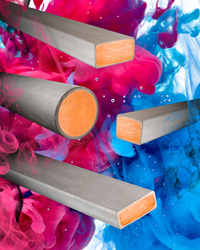 Anomet Products has introduced custom manufactured, highly corrosion-resistant conductors with high current carrying capacity that can withstand harsh environments and extreme thermal cycling. Anomet TiCu Clad Electrodes feature an OFHC copper core to provide uniform current distribution and a metallurgically bonded clad titanium exterior layer for optimum corrosion resistance. Reducing the number of repairs typically associated with wrapped bus bars, these clad electrodes are available round, square, and rectangular. Ideally suited for chemical processing, electroplating, metal finishing, and metal recovery applications, Anomet TiCu Clad Electrodes can be customized with cladding thickness from 10% to 90%. Metallurgical bonding assures superior ductility, formability, and weld-ability versus electro-plated products. Sizes range from 0.25” wire to 0.8” to 4.0” rectangles. Anomet TiCu Clad Electrodes Electrodes are priced according to formulation, size, and quantity. Pricing and samples are available upon request.